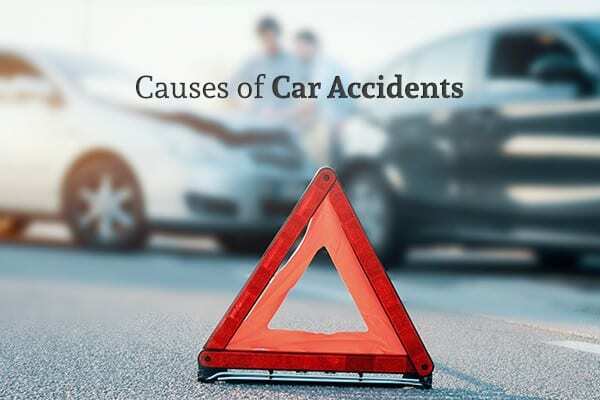 The Most Common Causes of Car Accidents | Branch & DhillonBranch & Dhillon, P.C. Distracted driving – including driving while texting, eating, having a conversation, or playing with the radio is the leading cause of car accidents. Every day in the U.S., around 9 people are killed as a result of distracted driving, often involving texting or other cell phone use. Because texting while driving is such a serious problem and leads to so many otherwise preventable accidents, many states have enacted laws that make using cell phones without a hands-free device a misdemeanor. Drivers can also be ticketed for using cell phones while behind the wheel, which will increase their insurance rates. And drivers who injure or kill someone else due to their own distraction may be charged with a felony, similar to those who drive while under the influence of drugs or alcohol. Traveling above the posted speed limit is another chief cause of car accidents. The faster a car is going, the longer it will take the driver to stop—and if high speed is compounded by reflex-altering circumstances like intoxication, distraction, or fatigue, the risk of collision becomes even greater. This is why speeding tickets have such a great impact on auto insurance rates, as a driver who speeds is a far greater claim risk than a slower driver. The National Highway Traffic Safety Administration (NHTSA) has enacted quite a few rules and regulations to prevent truck drivers from being on the road for too many hours at a time. Studies have shown that fatigue is just as dangerous as drunk driving, and semi trucks have the potential to do quite a bit of damage if a driver falls asleep behind the wheel. Drunk driving remains one of the top contributing factors to car accidents that cause injury and death. Although the drunk driving threshold was once 0.10 percent blood alcohol content (BAC), this threshold was reduced to 0.08 percent BAC in the late 1990s after studies showed this lower level was far more effective at preventing accidents. Drivers who cause injury or death while intoxicated can be charged with the most serious felonies, often facing decades in prison if convicted. With many states legalizing recreational and medicinal marijuana over the past decade, state governments have been challenged when it comes to enforcing their DUI laws. It can be tough to prove that a driver is intoxicated from marijuana, as marijuana’s metabolites can stay in a user’s system even after any effects have subsided. But despite its legally ambiguous status in many states, marijuana can have just as much of a negative impact on reaction times and overall driving skills as alcohol intoxication. Poor road conditions can increase the risk that a driver will be involved in an accident. On roads that are slick with rain, snow, or ice, actions such as sudden braking that are reasonable on sunny days may send your vehicle into a tailspin. Having bald tires or thinning brake pads can make it even harder for you to maintain control over your vehicle in poor weather conditions. It is important for drivers to have their tire tread and brakes checked a couple of times per year to reduce the risk of a car wreck. There’s a good reason that auto insurance rates for teen drivers are far higher than those for adults; inexperience can be one of the top contributing causes to fender-benders and more serious accidents. Even teenagers that have successfully completed a driver’s education program may not have the experience needed to anticipate other drivers’ actions and defend against them. Many states have placed additional restrictions on teen drivers to try to minimize the number of outside distractions they’ll be exposed to. Some of these laws include prohibiting teen drivers from transporting other teenagers or setting curfews to get teen drivers off the roads late at night. Every winter, the combination of ice, snow, and plowing can create some major potholes on many highways in the North and Midwest. Hitting one of these potholes can prompt a blown tire, which may send a car off the road or into the path of oncoming traffic. It is also relatively common for unsecured items to fall off the backs of vehicles, and drivers may find themselves dodging a crib mattress, tire, or chunk of firewood that has made its way to the middle of the road. Semi trucks can sometimes lose large strips of tire tread, and these trucks can do some damage if a driver is unable to avoid them. This is one reason it is so important to remain aware and to keep one’s eyes on the road while driving—often, just a second or two can be the difference between deftly avoiding a hazard and driving right into it. If you or a loved one has been the victim of a car crash, it is important to seek advice before you talk to the insurance company. Insurers—even your own insurance company—are mainly interested in settling the claim for as little as possible. The experienced attorneys at Branch & Dhillon, P.C. can make sure your rights are protected throughout the legal process. Visit their website to schedule a free, no-obligation consultation.